During 22 days in 1980, Mr. Romagoza was “beaten, shocked with electrical probes all over his body, sexually assaulted with a stick, and hung from the ceiling for several days” and also shot in the arm, his wounds left to fill with worms. Mr. Romagoza reported that General Vides saw him twice during his captivity. General Vides has a right to appeal the BIA’s decision to a U.S. court of appeals so we wait to see if that will happen and the results of any such appeal. Matter of Carlos Eugenio Vides Casanova, 26 I&N Dec. 494 (BIA 2015); Preston, General in El Salvador Torture and Killings Can Be Deported, Immigration Court Rules, N.Y. Times (Mar. 11, 2015). Prior posts reviewed the American churchwomen’s work in El Salvador; their 1980 murders; my pilgrimage to the sites of their work and murders; the Salvadoran non-judicial investigations of the crime; the Salvadoran judicial investigation and prosecution of this crime; the Salvadoran Truth Commission’s investigation of the crime; the unsuccessful U.S. civil lawsuit against the generals over the crime under the Torture Victims Protection Act; a 2014 New York Times retro-report of the crime; and the Immigration Judge’s finding, after trial, that Vides should be deported. A previous post discussed the civil liability of Salvadoran Generals Vides and Garcia for torture of these individuals under the U.S. Torture Victims Protection Act. As noted in a prior post, U.S. immigration law provides at least two means of enforcing international human rights. Removal or Deportation from the U.S.
Foreigners can be deported or removed from the U.S. if they “ordered, incited, assisted, or otherwise participated in genocide . . . or . . . any act of torture . . . or . . . any extrajudicial killing.” (Intelligence Reform and Terrorism Prevention Act of 2004 sec. 5501, 118 Stat. 3638, 3740 (2004). Responsibility for enforcing these provisions lies in the Human Rights Violators and War Crimes Unit (HRVWCU) within the National Security Investigations Division (NSID) of the Homeland Security Investigations (HIS) Directorate of the U.S. Immigration and Customs Enforcement (ICE) of the Department of Homeland Security. This unit conducts investigations focused on foreign human rights violations by individuals in the U.S. in an effort to prevent the U.S. from becoming a safe haven to those individuals who engage in the commission of war crimes, genocide, torture and other forms of serious human rights abuses from conflicts around the globe. Since fiscal year 2004, ICE has arrested more than 250 individuals for human rights-related violations under various criminal and/or immigration statutes. During that same period, ICE has denied more than 117 individuals from obtaining entry visas to the United States and created more than 20,000 subject records, which prevented identified human-rights violators from attempting to enter the United States. In addition, ICE successfully obtained deportation orders to physically remove more than 590 known or suspected human rights violators from the United States. Currently, ICE is pursuing more than 1,900 leads and removal cases that involve suspected human rights violators from nearly 96 different countries. Illustrating such cases are two former Salvadoran military officers, Carlos Eugenio Vides Casanova and Jose Guillermo Garcia, and a former Guatemalan military officer, Pedro Pimentel Rios. In 2012, an immigration judge ruled that Casanova could be deported for his role in multiple acts of killings and torture committed by the Salvadoran military, including the 1980 slayings of the four American churchwomen. On February 6, 2014, the U.S. Board of Immigration Appeals (BIA) heard Casanova’s appeal from this decision. The main issue was his argument that the removal order was unjustified because the U.S. tacitly had approved the aggressive tactics of the Salvadoran military. In response the ICE attorney argued that U.S. support for the Salvadoran military did not excuse Casanova’s actions and that the U.S. repeatedly had demanded that the Salvadoran military clean up its human rights record. One of the three BIA judges asked whether Casanova was “too far up the chain [of command] to control those units?” The ICE attorney said “no” as Casanova himself testified at his own trial that he kept tight control of the unit. Once the BIA issues its decision, the losing party has the right to appeal to a federal court of appeals. On February 26, 2014, an immigration judge ordered Garcia to be removed or deported from the U.S. after a trial had determined that he had helped conceal the involvement of soldiers who killed four American churchwomen in 1980 and that he “knew or should have known” that army troops had slaughtered the villagers, including women and children, in the hamlet of El Mozote in 1981. Garcia plans to appeal to the BIA. In July 2010, ICE charged Guatemalan Pedro Pimentel Rios with being deportable for having assisted or otherwise participated in extrajudicial killings during the Dos Erres massacre in that country. In May 2011 an immigration judge, after trial, determined that he had in fact participated in extrajudicial killings in that massacre and ordered his removal to his home country. That removal occurred in July 2011. After his return to Guatemala, he was tried by a three-judge court and found guilty of participation in the massacre and sentenced to imprisonment of 6,060 years (30 years for each of the 201 victims). This sentence was largely symbolic since Guatemalan law does not permit prison terms longer than 50 years. Foreigners who had gained legal entry or presence in the U.S. can be criminally prosecuted for committing fraud in obtaining a U.S. visa or other immigration benefit (18 U.S.C. § 1546(a)) or committing perjury in statements to U.S. immigration officials (18 U.S.C. § 1621(2)) for failure to disclose their involvement in foreign human rights violations. Examples of such cases are those involving former Salvadoran military officer, Innocente Orlando Montano, and two former Guatemalan military officers, Gilberto Jordan and Jorge Sosa Orantes. Montano allegedly was involved in various human rights violations in his country, including the November 1989 murder of the six Jesuit priests and their housekeeper and her daughter. Based on his guilty plea, on August 27, 2013, the federal court in Boston, Massachusetts sentenced Inocente Orlando Montano to 21 months in prison for violating U.S. immigration laws. On October 1, 2013, Jorge Sosa Orantes, a Guatemalan military officer who lead a massacre of a village in his home country, was convicted by a federal jury for making false statements and unlawfully procuring U.S. citizenship when he applied for U.S. residency in 1997 and when he obtained citizenship a decade later. On February 10, 2014, the presiding judge sentenced Sosa with a revocation of his U.S. citizenship and imprisonment for 10 years. 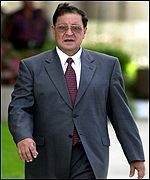 Garcia and Casanova jointly had been held civilly liable for torture in their country by U.S. federal courts under the Alien Tort Statute (ATS) and the Torture Victims Protection Act (TVPA), but who jointly had escaped similar civil liability under the TVPA for the torture and murder of the four American churchwomen in El Salvador.